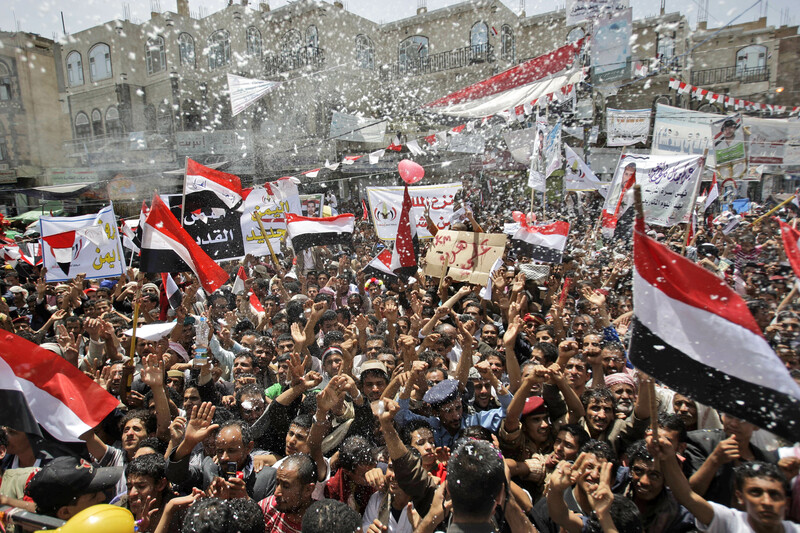 People danced in the streets as news spread of President Saleh’s departure from Yemen. He was wounded in a bomb attack at the Presidential compound. The severity of his injuries ensure that he is out of play, prompting a power struggle. The protestors have been demanding his ouster for months. The Saudis and the Americans want him replaced by his vice president and put in place a unity government with the reigning party and the throughly discredited loyal opposition, the so called Joint Meetings Party. The protestors have rejected any such efforts at cosmetic change. According to the Economist, they risk exclusion from formal politics and marginalization. Meanwhile, civil strife continues to plague this godforsaken place. The editors then use a classic narrative device to create a sense that there is widespread disagreement in the opposition. Since there is virtually unanimous opposition to the GCC solution, they highlight a triviality on which there is disagreement: immunity for Saleh’s family. It does not matter. The chief demand echoed by jubilant crowds across Sana and other Yemeni cities on Friday was: “The people want a transitional council!”, i.e., a civilian council of technocrats to run the state while the stage is set for free and fair elections. Things are just about to get extremely exciting. The Assad regime has really started tottering. The balance of power is shifting. Angry crowds are thronging all over Syria. The big question is what is going on in Damascus and Aleppo, the second largest city. There is plenty of evidence that unrest is spreading there as well. Although the protests and crackdown have been not as intense as the hinterland. More promisingly, there have been reports of a mutiny in the security forces at Jisr al-Shughour which the regime is painting as an ambush by an armed gang. Most of the rank of file of the security forces are Sunni while the officer corps is dominated by the Alawite minority. The regime is of course an Alawite dominated one. This has never come into play because they are regarded as Arab, and there is a strong constituency in Syrian society that has this view including parts of the business elites in Damascus. But I am confident that the protestors in the rest of Syria are not targeting the Alawites as a sect, there is virtually no evidence of sectarian conflict although it may yet arise. [It has already begun.] One has to worry about the advent of sectarian conflict every time a rigid power structure is broken. Each regime that falls unleashes hitherto buried rivalries and groups that compete for power. Ethno-religious and sectarian mobilization are routinely used by many actors bidding for power. Their ability to persuade communities however depends on the level of indoctrination. The regime has also stepped up the crackdown, sending tanks and artillary to the north and east. The BBC estimates that more than 1300 people have been killed by the regime so far. For the Arab spring to succeed, the protestors need to come together to form a political party, and compete in the up coming elections. Otherwise they are going to replace Mubarak with Suleiman and presidents for vice presidents. Nothing will change without a change of guard. Things are very fluid and the Arab Spring may yet turn into summer. Remember the observers who said there are no more dominoes to fall? They were wrong.